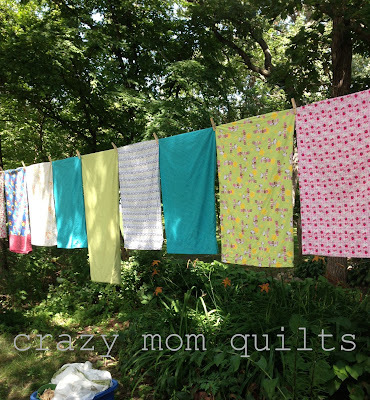 Not to air my clean laundry or anything (har har har), but I am celebrating because my husband installed a clothesline for me this weekend! Line dried sheets are the BEST! 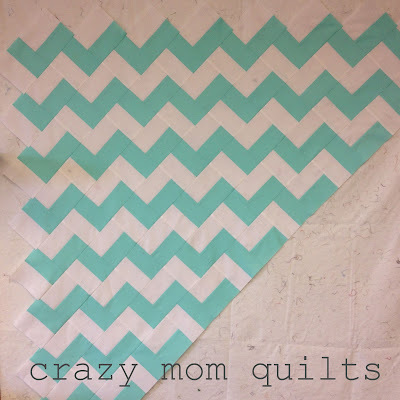 I've had a bunch of questions about the zig zag tutorial that I linked to last Wednesday. The blog is GONE, and so is the tutorial. 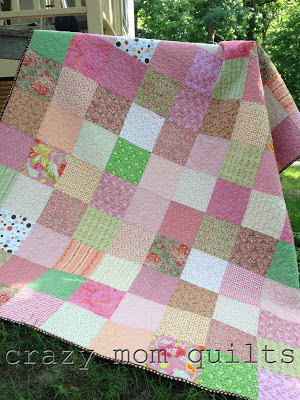 I never published it on my own blog and I don't have the instructions written down anywhere (argh!!!) 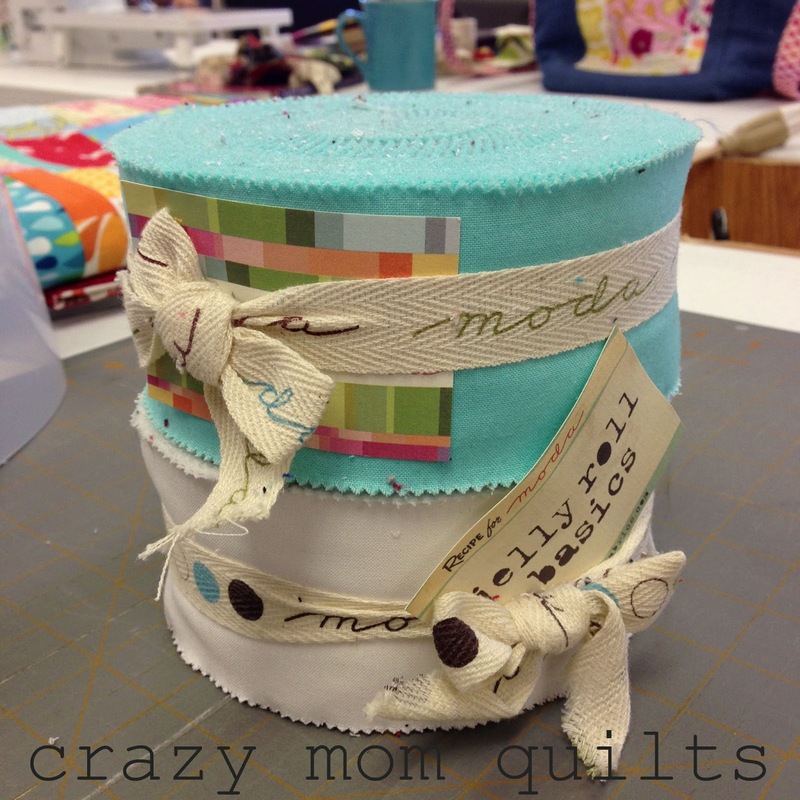 so please use the moda pdf here. Thank you! So, I have a hard time throwing ANY scraps away. I realize that is stating the obvious. (ha!) 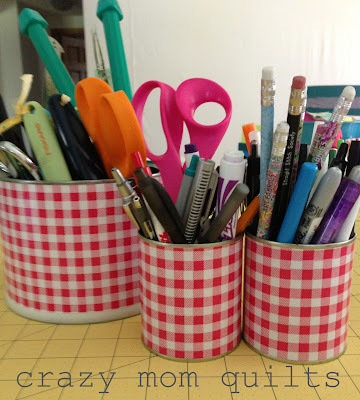 Leftover strips of oil cloth from the van trash cans that I made last year are no exception. I had the remnants rolled up and stored IN my pencil can for months. One day I had an "aha!" moment. 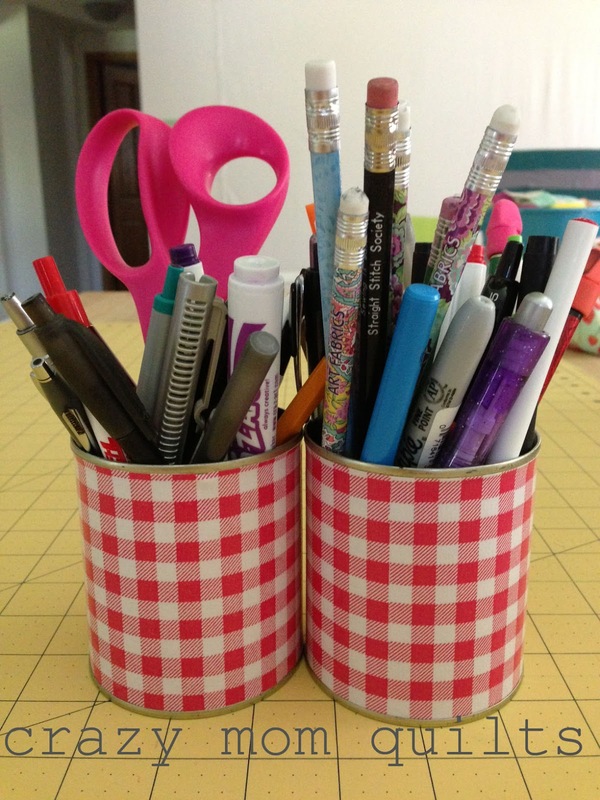 Why not use the scraps to cover the outside of the can? 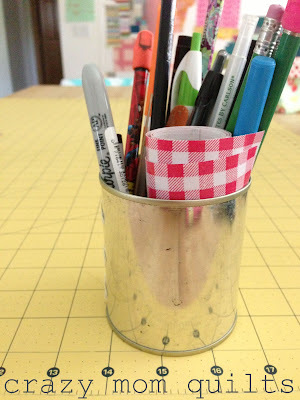 I trimmed the oil cloth to size and used a little scotch tape to hold it in place. Super cute, right? And then I used the rest to cover my larger tool bucket. SUPER easy, super cute. The best part? There was virtually no waste! 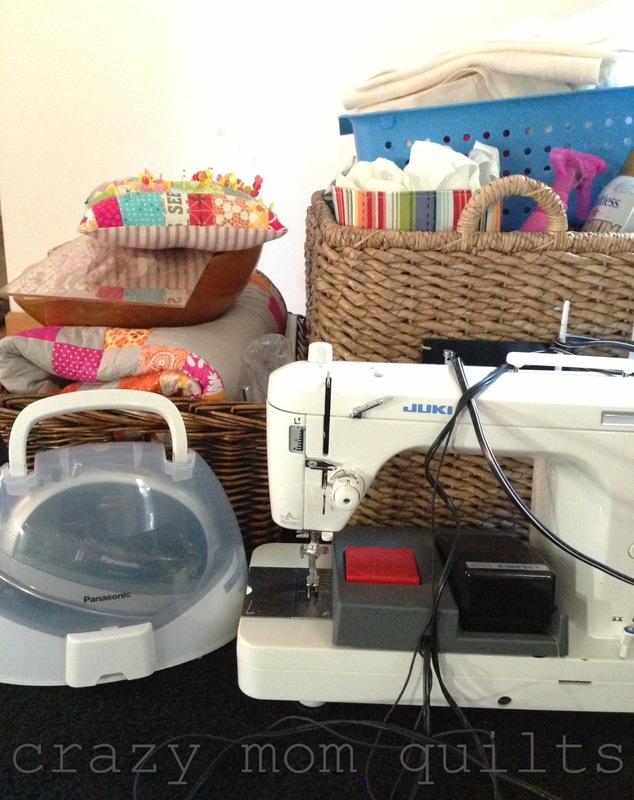 Plus, they make my sewing area much cheerier! This one has extremely TINY pieces....14 little bits in a 6" strip. Welcome to finish it up Friday! 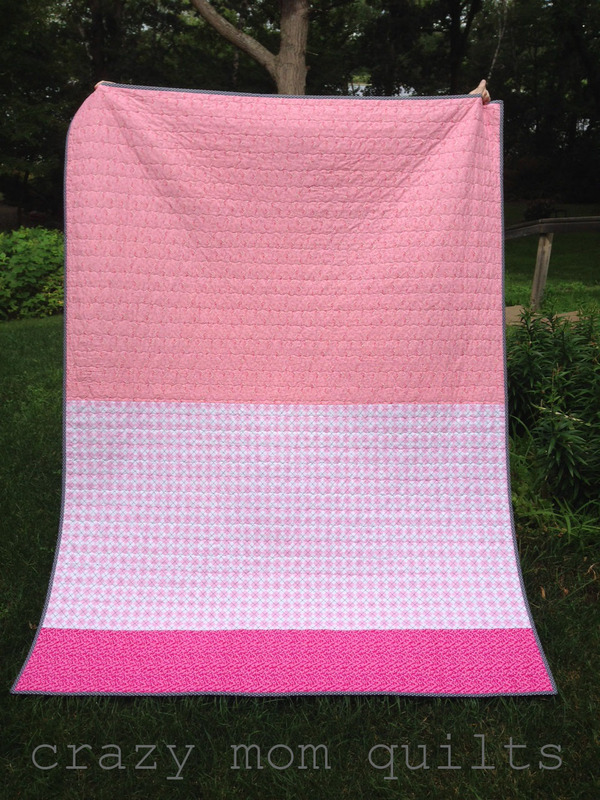 I'm pleased to have a finished quilt to share today! edited to add: the pattern for this quilt can be found here. I called this quilt 'relinquishing control' for a few reasons. 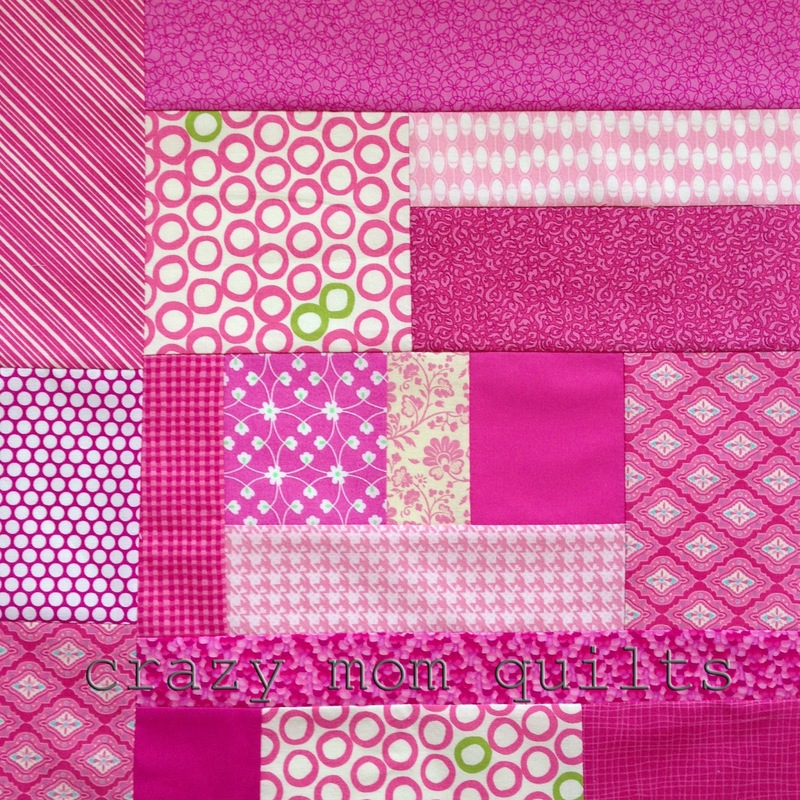 First, because it was my first attempt at a mystery quilt, which was a fun and challenging undertaking. Also, because I pieced it when we were in the midst of selling our house, my husband was commuting and life felt more than a little upside down. I'm so glad that is all over now! At some point this week I came to the realization that this place feels like HOME...at about the same time that I finished my quilt. Hmmm. 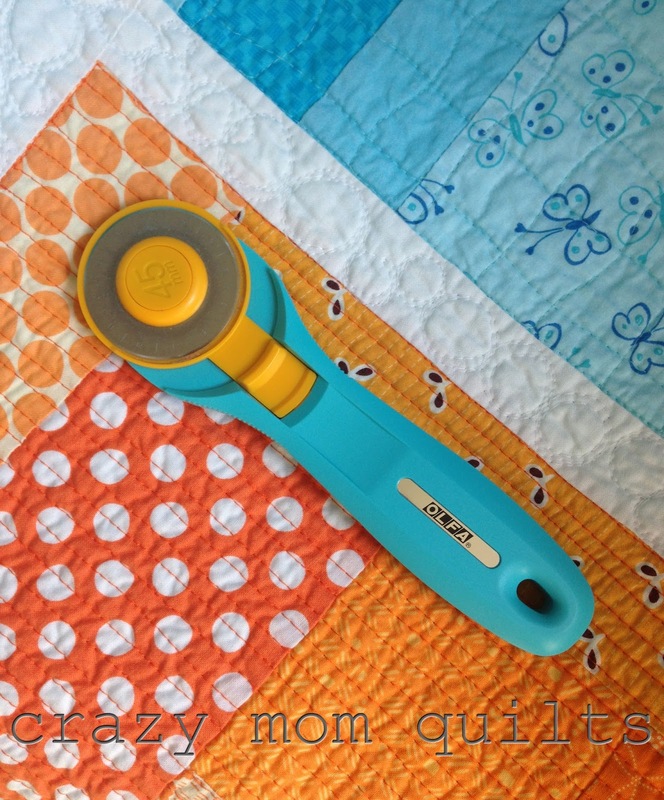 You can't tell me that quilting isn't good therapy! 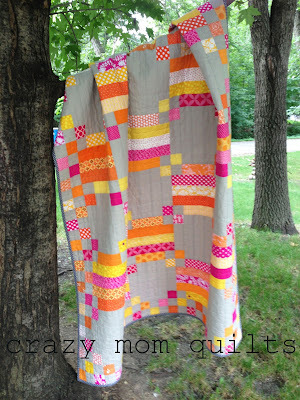 Now that the quilt is finished, I have to laugh. 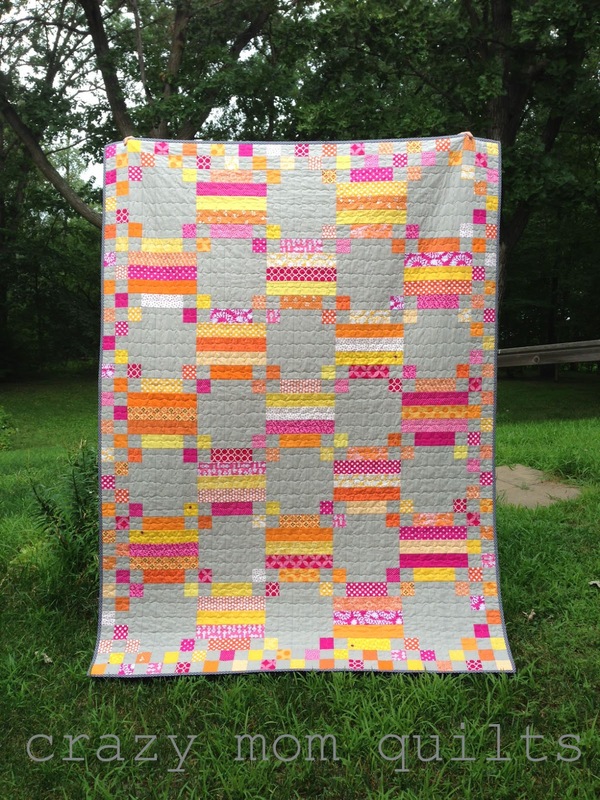 If there ever was a perfect mystery quilt for me, this one is it! 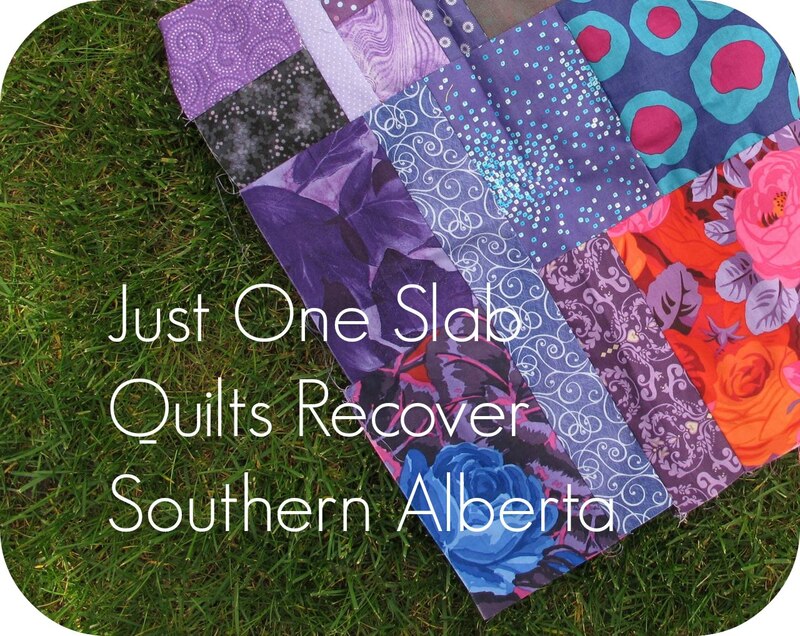 It required no strip piecing (yay!) and it has lots of 2" finished squares (even better!). I tend to work with a lot of blues and greens, so it was nice to switch things up and use warm colors instead. ALL the fabric came from my stash. 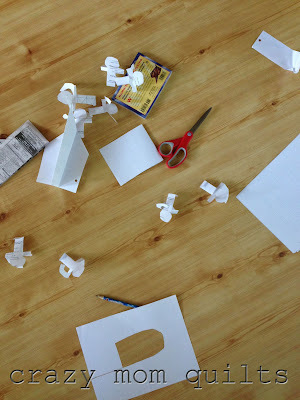 (My favorite way to work!) The background is Ash Gray by Connecting Threads. It's such a great color to have on hand. For the back I pieced a few different pinks together. I love the pop of bright pink on the bottom. I think it really helps tie the front and back sides together. This sweet 30's print isn't too shabby, either! I LOVE the binding! The fabric is 'spot on' by Robert Kaufman. I bought 2 yards of it when I visited Olive Juice in March. 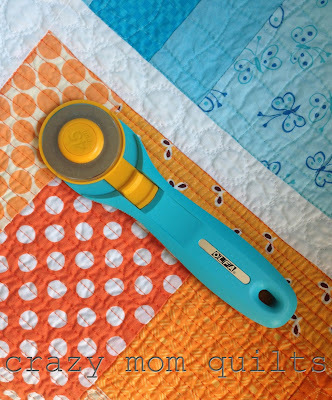 It will probably appear on a few more (3, most likely) quilts as binding. The scale of the dot is just perfect and it's such a pleasing shade of gray. I had to include this outtake....my oldest boy helps me with my quilt photography. This morning he even helped with a good attitude. I sure love my kiddos! 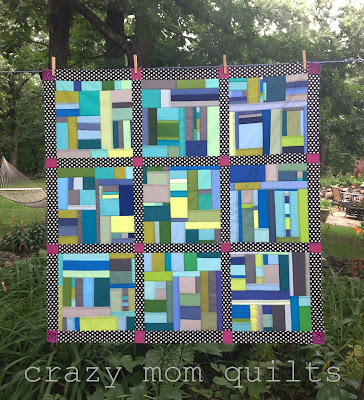 The finished quilt measures about 58" x 78". I am not going to do a whole retreat run down post from this past weekend, but I must say, we had so much fun! 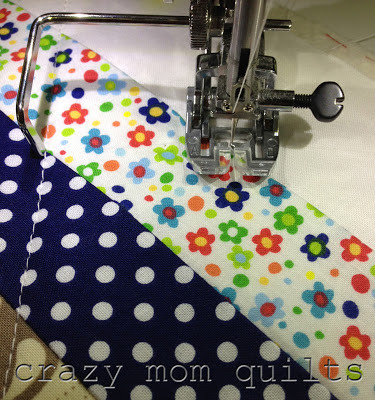 Sewing and laughing with friends is darn good therapy. I laughed until I cried-several times over. Thanks so much to my Gruber's friends for a fantabulous weekend. You all are the best! 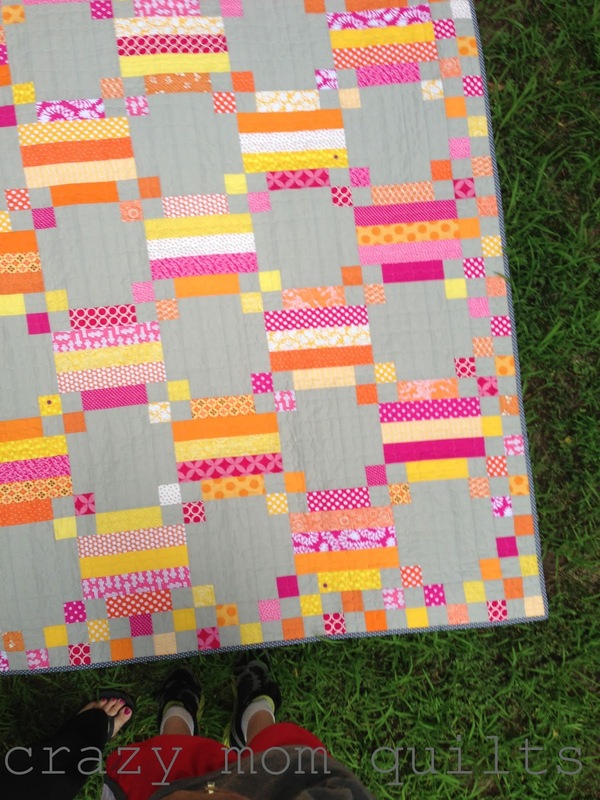 I started a new quilt while I was on retreat. The color choices may surprise you, I realize. (ha!) I'm making a zig zag quilt with no triangles. This one has been on my to-do list for quite some time. I decided it's time to stop hoarding my pretty jelly rolls and start sewing. The colors are 9900 98 White and 9900 85 Egg Blue. Moda made a pattern sheet using the technique and there is a free pdf here. 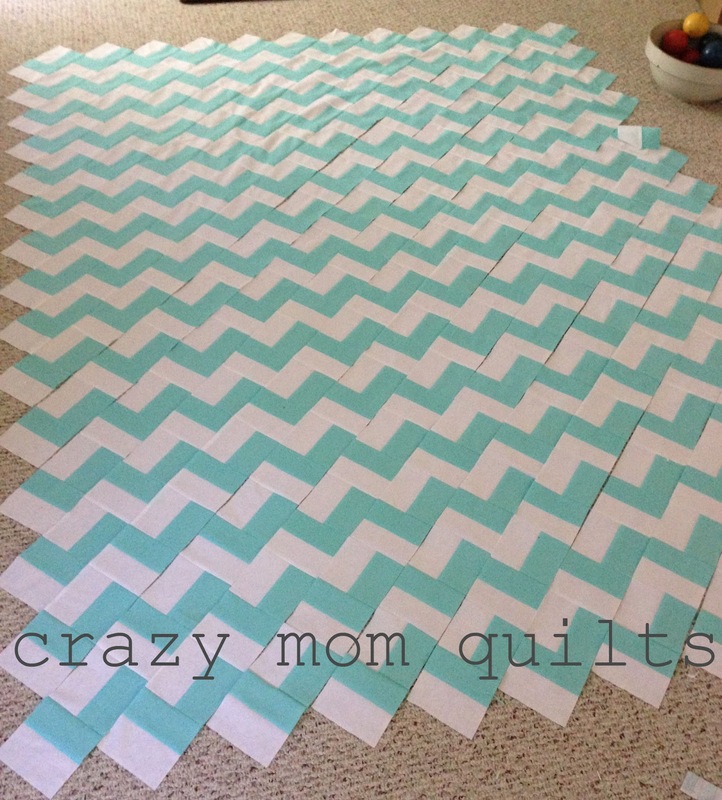 I have several more rows to sew together, but I'm getting there! 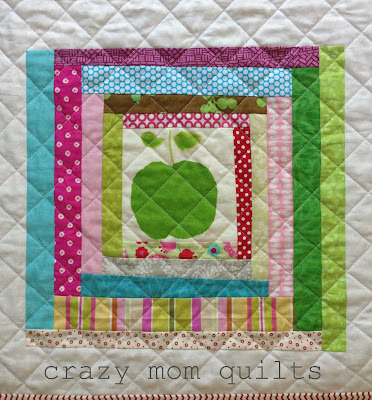 I am absolutely smitten with the simplicity of this quilt. 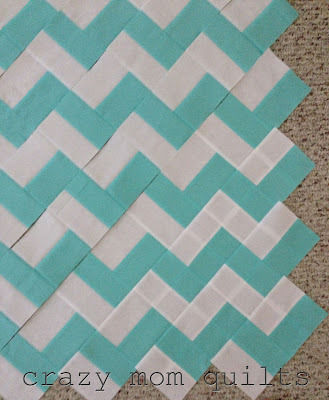 The aqua and white color comb isn't too shabby, either. 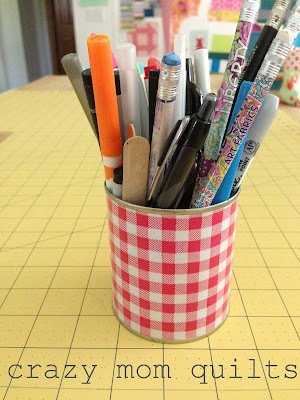 I'm linking up with Lee for WIP Wednesday. Did you hear? 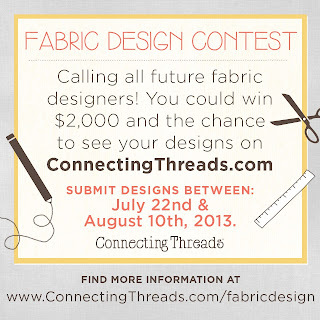 Connecting Threads is holding another design contest this year! 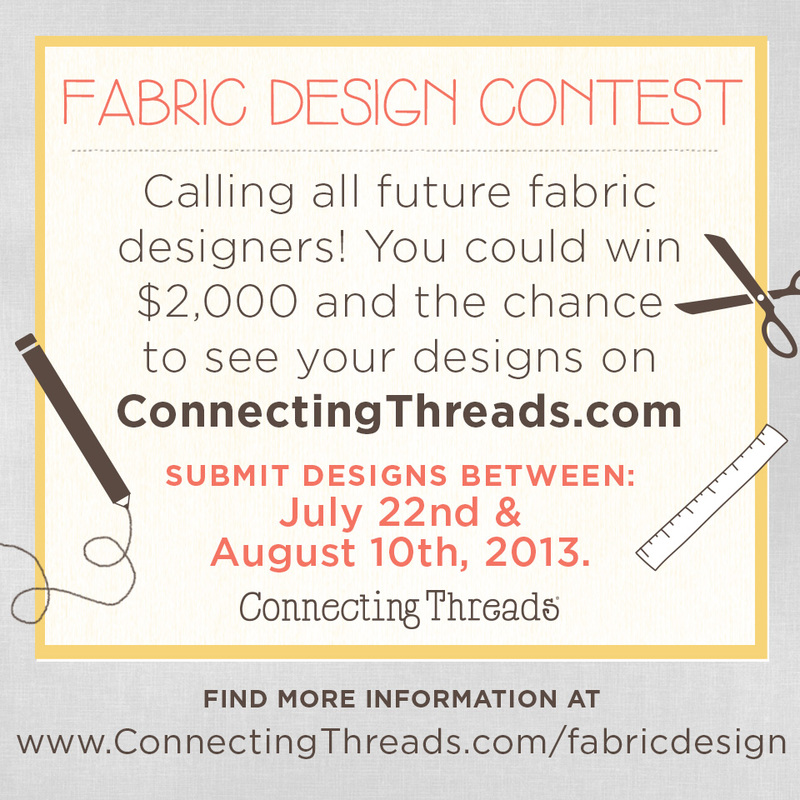 They are taking submissions from July 22 through August 10th. You can read all about the contest here and the guidelines are here. I may be thinking of submitting something....yikes! Now, on to the scraps! 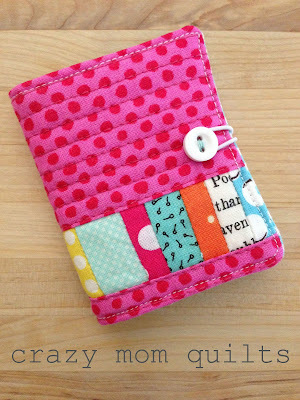 I'm already finding that my 101 scrap project challenge is a fun way to play with various color combinations and techniques on a small scale. Using up scraps will simply be a nice side benefit! This is a little block that I made while playing with scraps a few weeks ago. 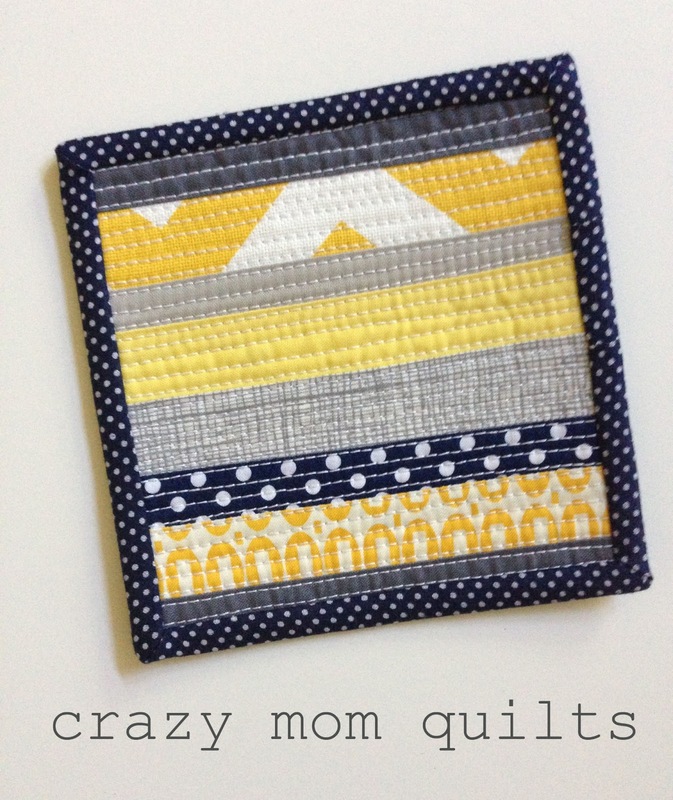 The color scheme reminded me of a friend, so I turned it into a coaster or mini mug rug (whatever you want to call it) for her. 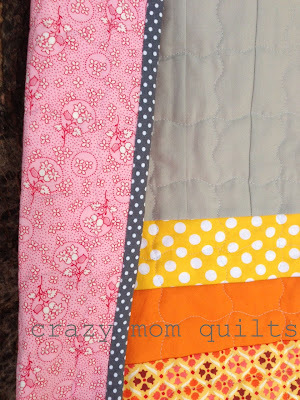 I quilted with 25 weight hand quilting thread* that I ran through my Juki. 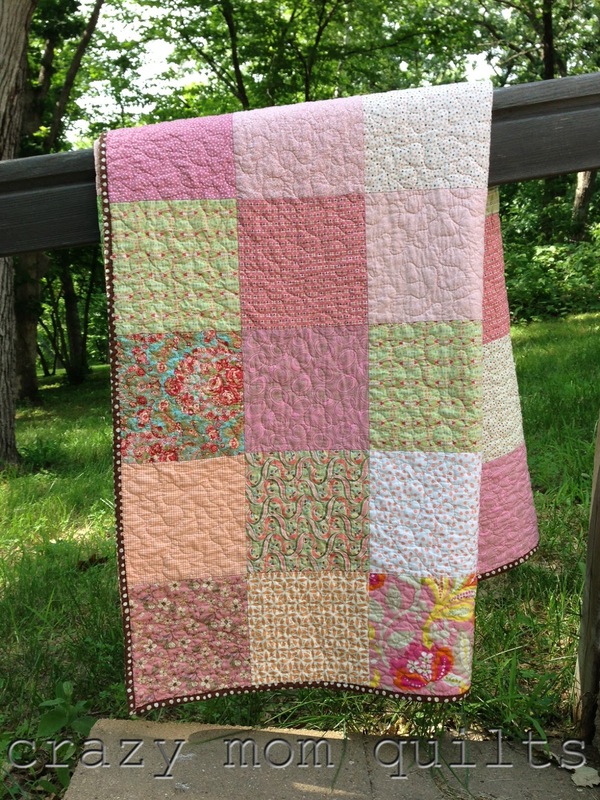 It makes a clearly-defined chunky stitch that I really like!! 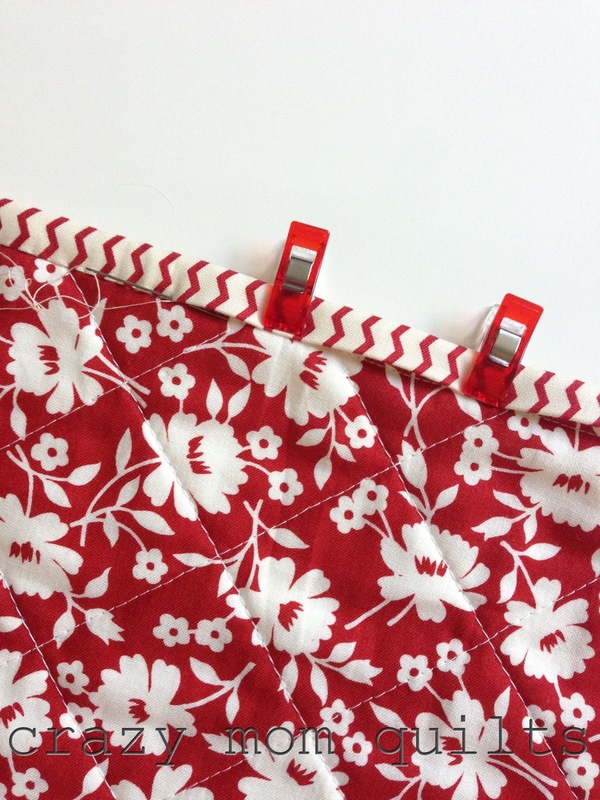 I used a regular quilting thread (50 weight) in the bobbin and there was no need to adjust the tension at all. It was FUN! I quilted the piece heavily, as you can see. You can get away with that on a small piece and it doesn't take forever. Hurray! 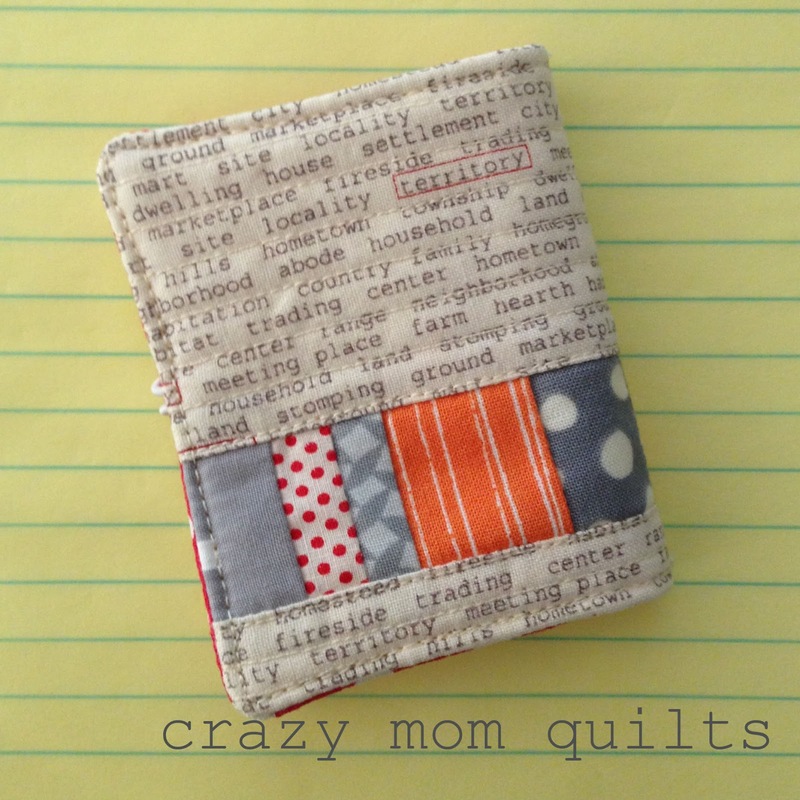 To finish it off, I used a single fold binding. Carol has a great tutorial for that here. If you have to bind a small project, I highly recommend it! 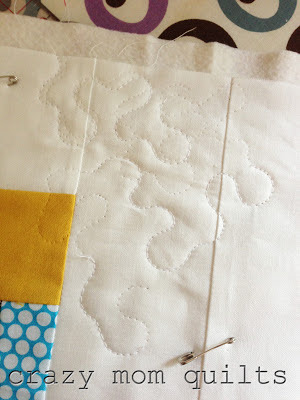 *I should note that this hand quilting thread (by Robison-Anton) is uncoated. I know that some hand quilting thread (Coats and Clark for instance) is coated and will NOT work in a sewing machine. 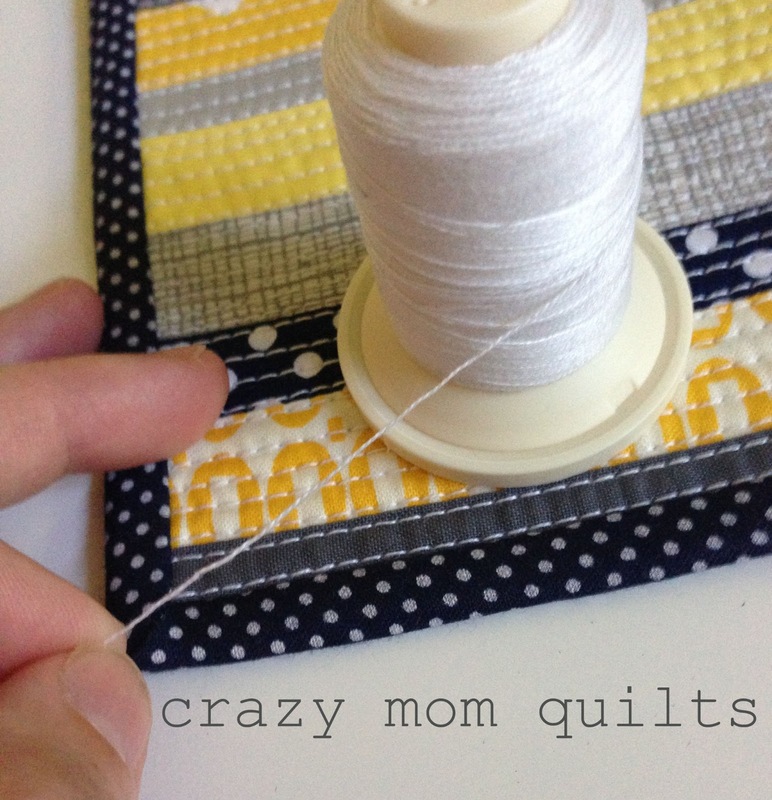 I haven't tested other kinds of threads, so I can't recommend or give further advice on them. I've decided to take on a personal challenge. I'm setting out to make 101 projects out of scraps. I'm planning to document them here. But I am super excited. I certainly have the scraps for it...and then some! 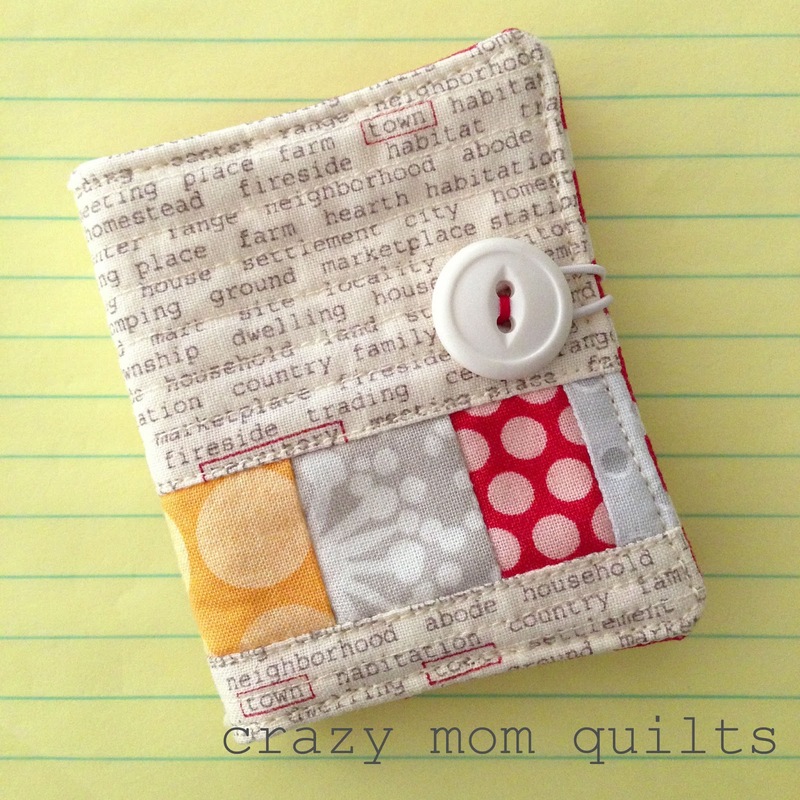 Here's my first project of the series....a little needle book. It finishes at 2 3/4" x 3 1/8". I think I've squealed over this thing 100 times. 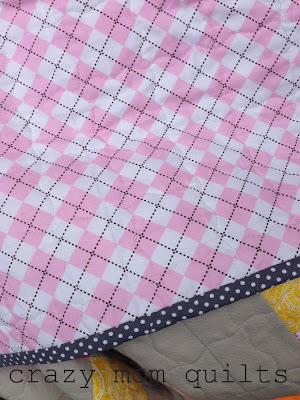 Of course I used red and white polka dots for the lining. The pages are just a bit of leftover batting. The elastic band previously held a pair of shoes together. I'm really looking forward to the next 100 projects! 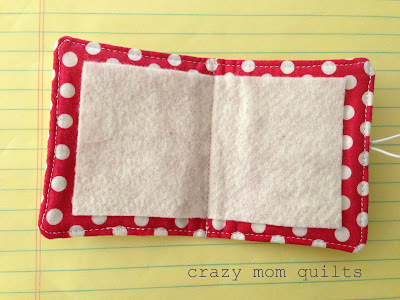 I have started a new scrap project. A l o n g term project. I have been debating it for over a year. 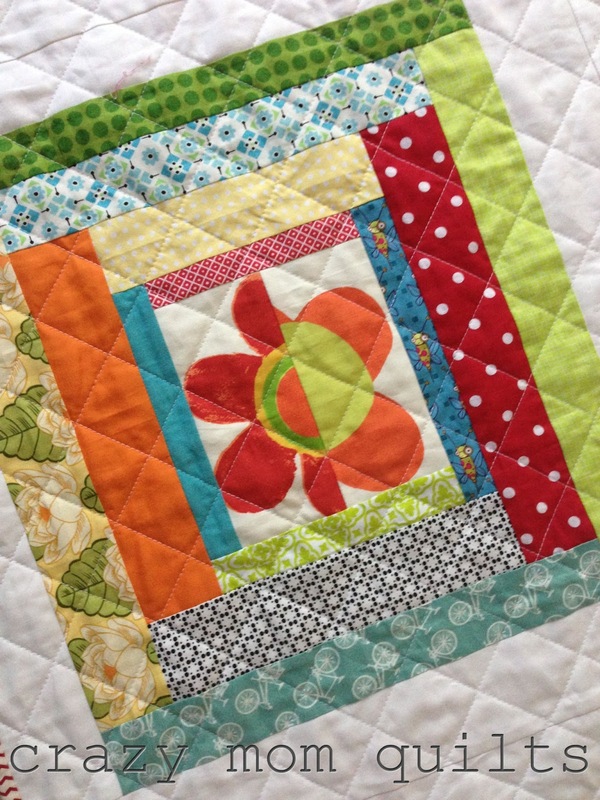 The pattern for the block can be found in this tutorial. 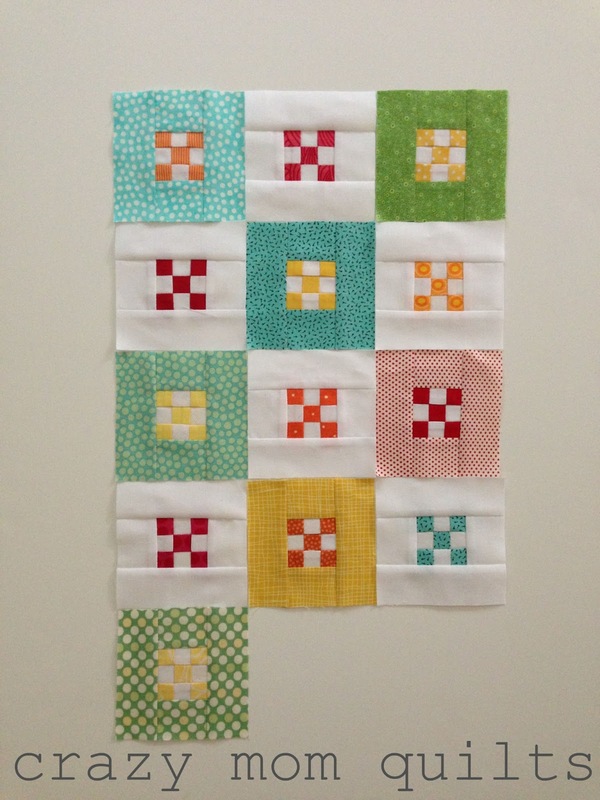 Each block will finish at 3.5". If you'd like to join me, I would LOVE to have you along for this (somewhat) crazy journey. 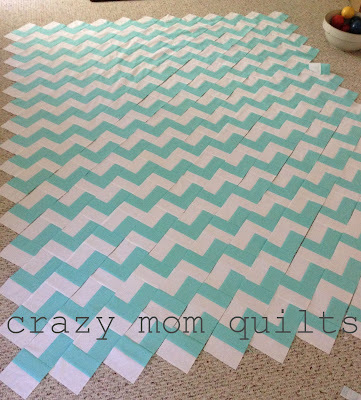 My target quilt size is 63" x 77". I will need a total of 396 blocks. I'm looking for a good name for this project. 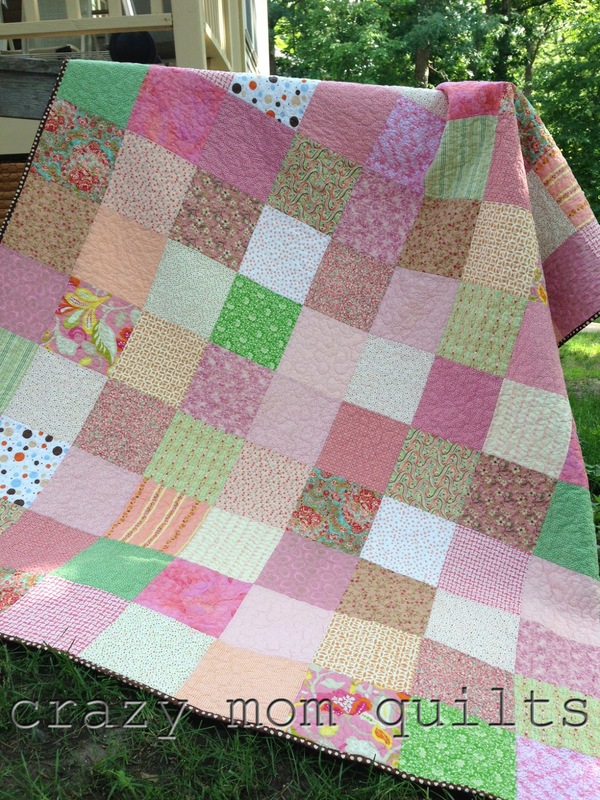 I finished my wonky log cabin quilt this morning. I LOVE how it turned out! 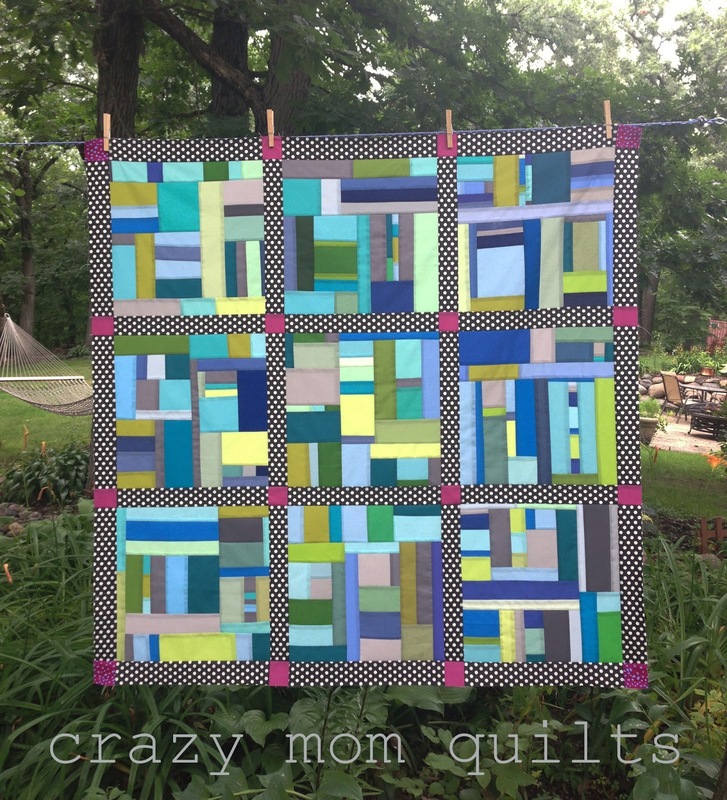 It's such a happy quilt. 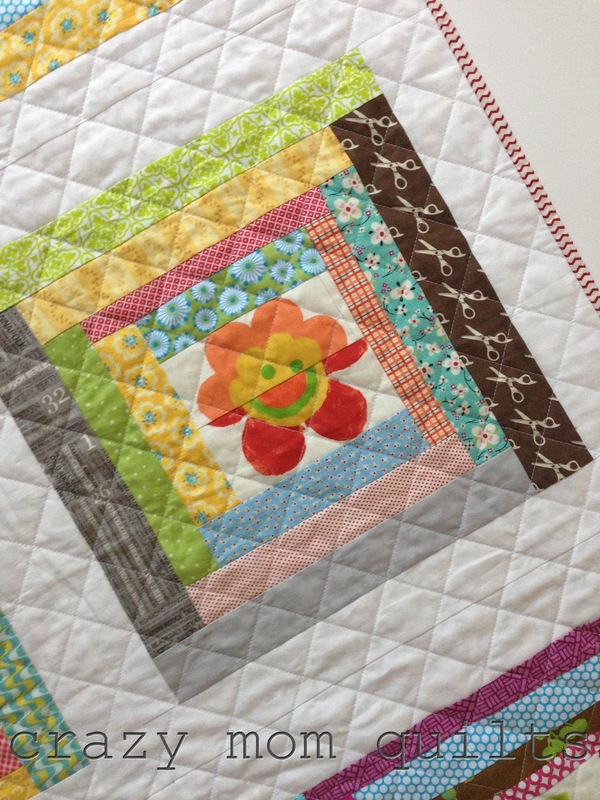 Two of the center blocks have pieced flowers....true to my thrifty nature. This one has been dubbed the smiley face block. :) I almost omitted these funky blocks, but my kids talked me out of it. I'm glad they did! 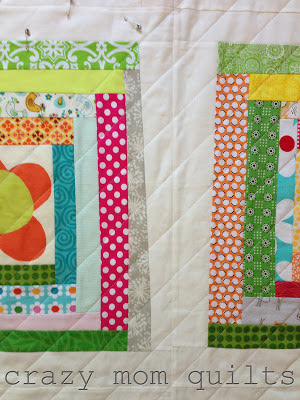 The blocks certainly add a lot of character to the quilt. 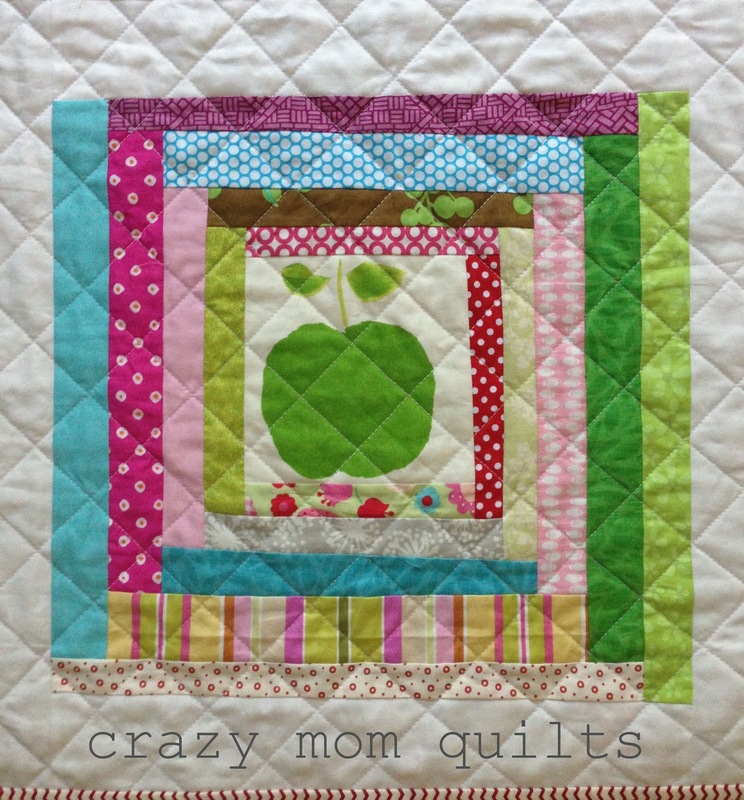 This is one of the last ones that I pieced. I think it's my favorite one! 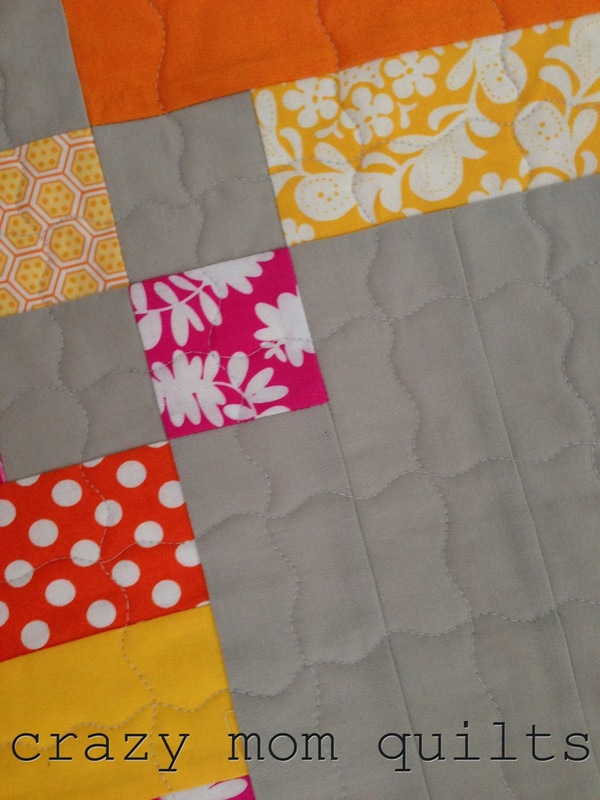 Each block measures 15" square, which includes the white sashing. 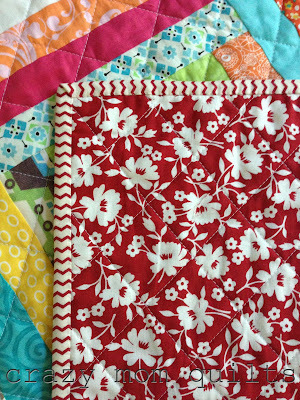 Originally I was going to stipple the quilt, but after some troubles I went with a cross hatch instead. I'm so glad things worked out that way. 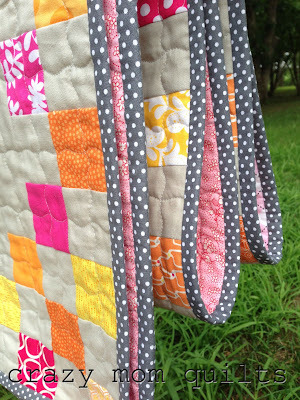 The cross hatch quilting adds so much...on both the front and the back. The grid lines are about 2" apart. The backing and binding fabric came from my stash. The combination of the two ended up being so happy and perfect! I always struggle when selecting a back for a scrappy quilt. Mainly because almost anything would work...it's hard to narrow things down. 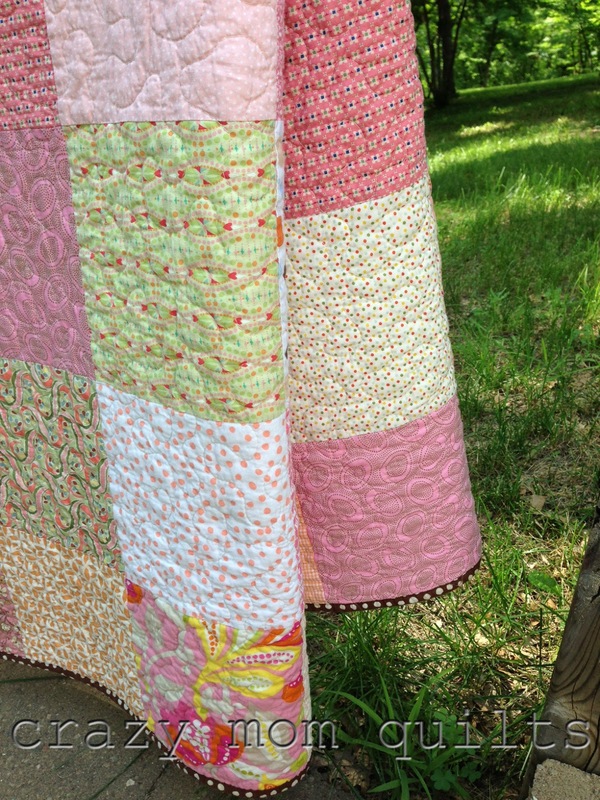 The scraps in this quilt came from many previous projects and several came from generous friends. 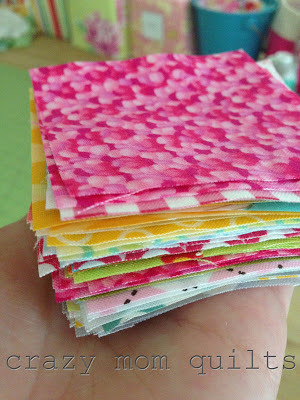 So many happy fabrics in the mix...just the way I like it! 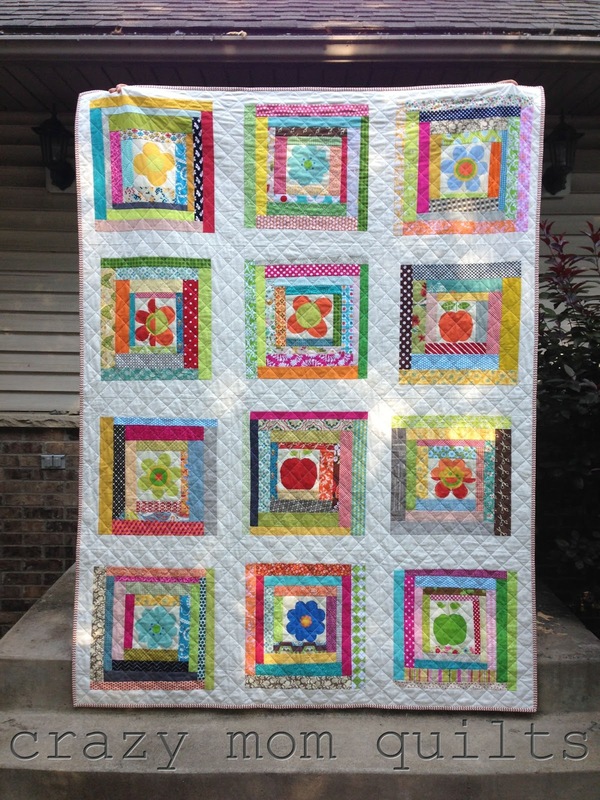 The quilt measures 60" x 80". One more thing for today. I snapped this photo this morning. My kids are home from camp. :) I'm so happy to have them back! Now it's your turn to link up your finishes. Thanks, as always, for joining me for finish it up Friday! 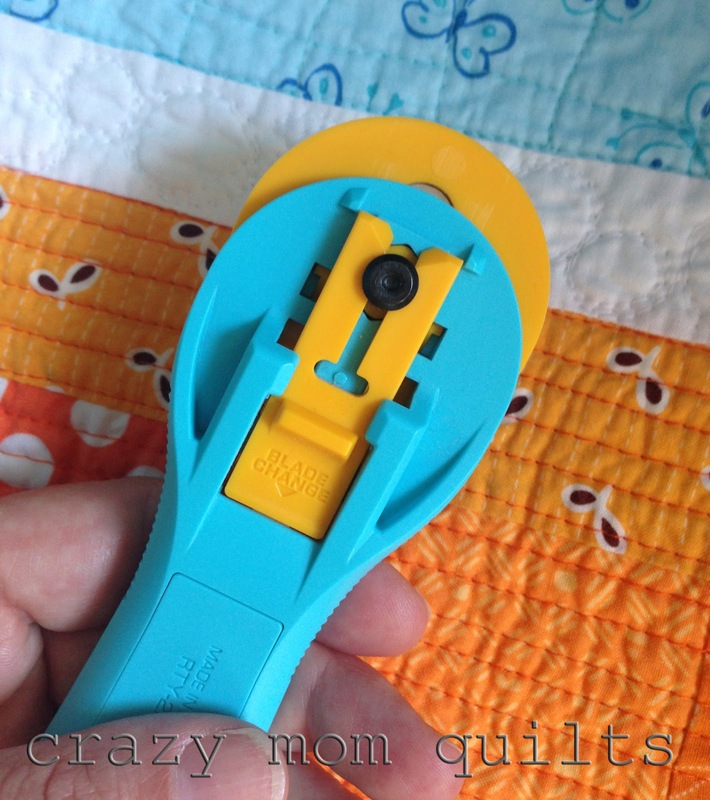 The winner of the Splash rotary cutter is New Salem Homestead. Thanks to all of you who joined in the contest! My kids have been at camp this week...and boy do I miss them! I thought I would have gobs of sewing time, but I didn't finish all my WIPs like I had hoped. Are you laughing along with me? Yes, that is a ridiculous notion, but it is nice to day dream once in awhile. Since I can't work on just one project at a time, I also started quilting my mystery quilt. 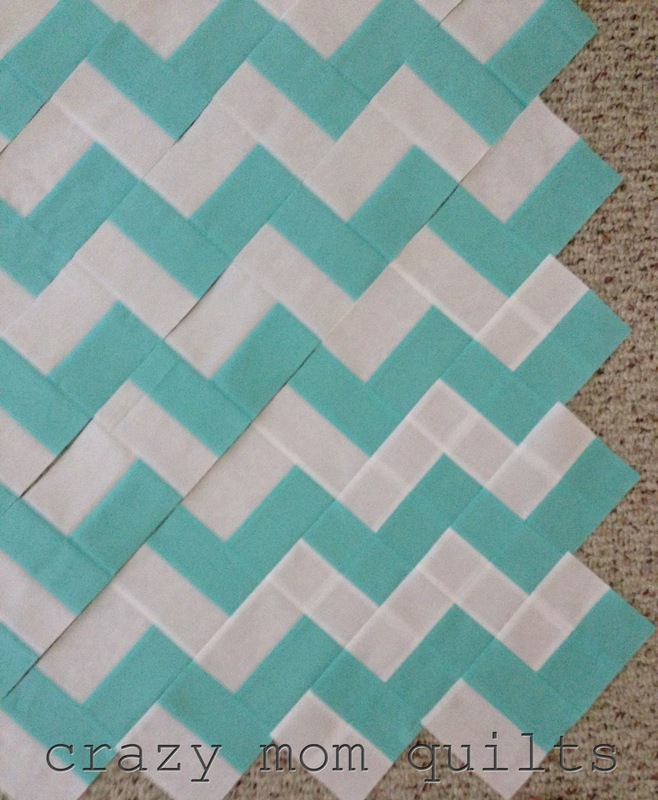 I chose to go with a wavy grid over the entire piece. No marking is required, as I am following the strips as they were pieced. I'm using a darning foot with the feed dogs down and quilting the squiggles free hand. It is so much fun! I don't think that I could ever tire seeing crosshatching emerge, whether it be a straight line or a wavy one. It's like a little bit of magic! Thanks for all of you who entered into the draw for the Splash cutter. (if you haven't yet, you still have a bit of time.) I plan to pick a winner later today. I LOVED reading what you are looking forward to this week! When the folks at Olfa asked if I would like to try out one of their new Splash rotary cutters and blog about it, I just couldn't say no! The name "splash" and the fun color scheme had me hooked immediately. I have a quilt called Splash (shown below, it's a pattern in Sunday Morning Quilts) that matches the new cutter exactly. That is pretty fun! 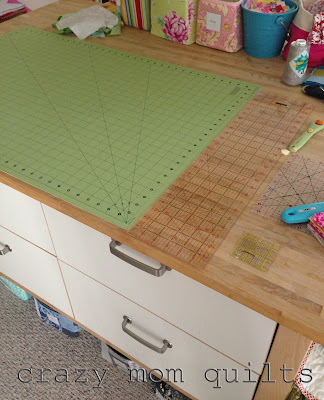 I usually dread cutting, but between a cute new cutter and my new counter height cutting table, (see below) I've actually started to enjoy the process. In fact, I've started a few new habits. Whenever I cut for a project, I cut out a few extra 3" squares. 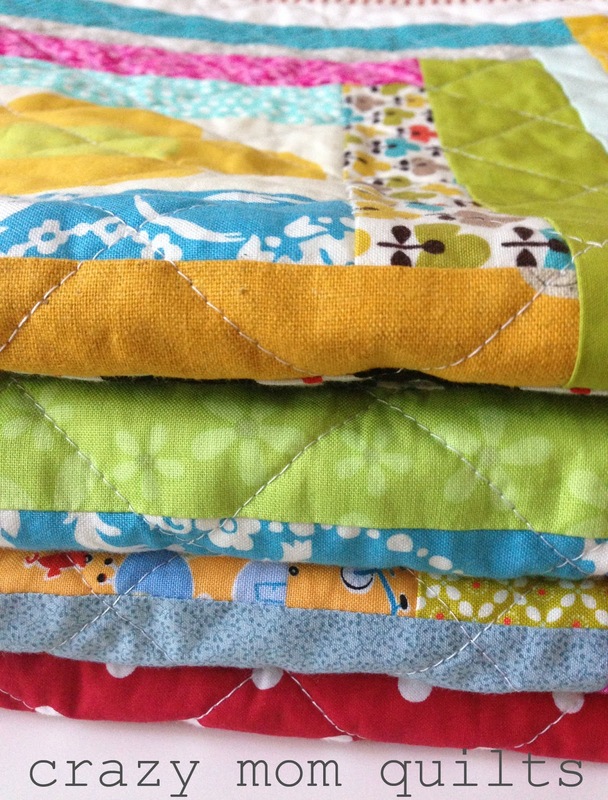 When I'm ironing, I'll grab a scrap or two out of one of my many scrap baskets, press them, cut out a few 3" squares and add them to the pile. Between those two new habits, eventually I'll have enough squares to sew together into a quilt. I hope you all had a safe and great Independence Day! We celebrated with my entire family...17 of us! We hosted and found out that our house is set up very nicely for entertaining. Hurray! I turned 38 yesterday and my sister had a birthday, too. The weather was perfect and it was so nice to have all of us together. I'm so thankful for my own little family and my extended family as well. I'm thankful for another year and I'm looking forward to making it count. 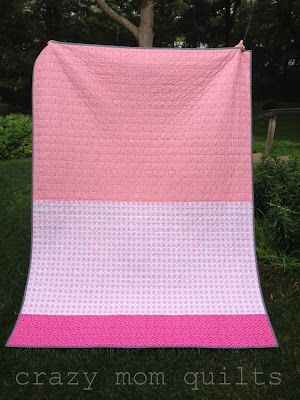 Even amid the summer busyness, I managed to finish up a charity quilt this week. 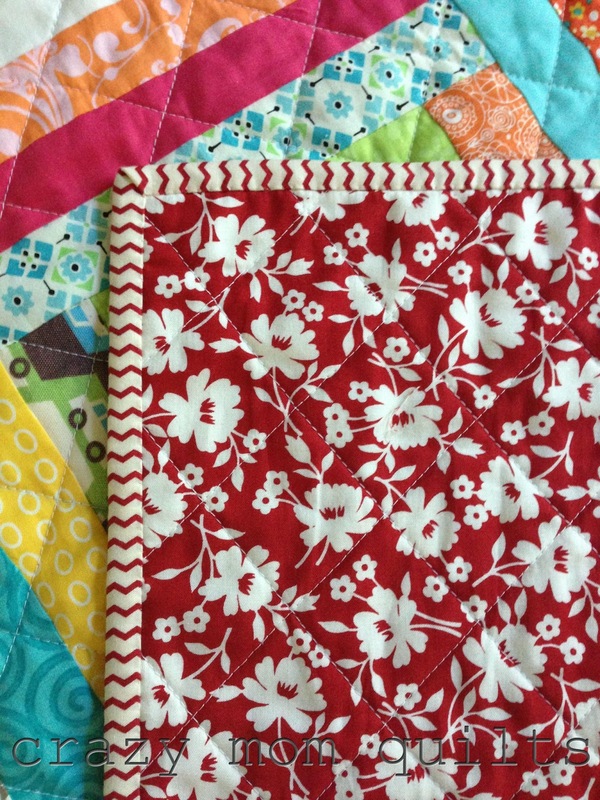 Heather pieced and quilted it and all I had to do was add the binding. It may have taken me a few months. 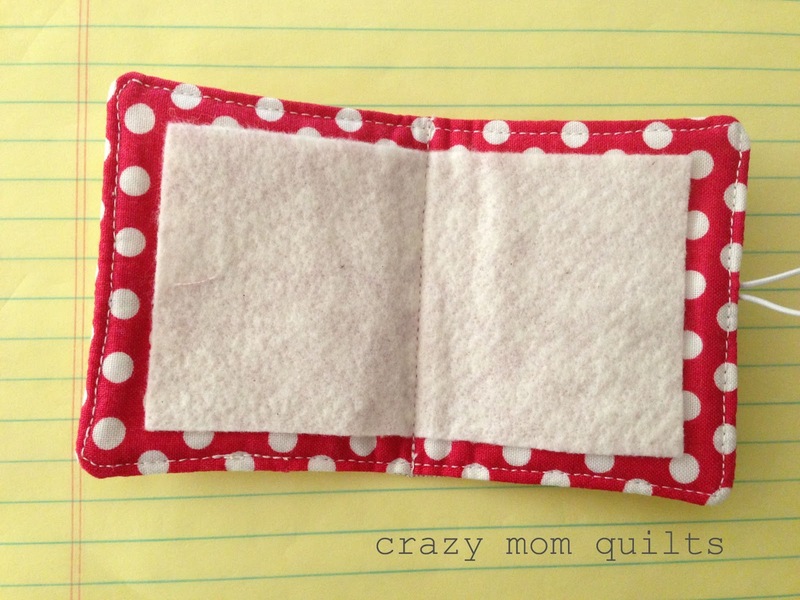 :) I decided to machine stitch it down on both sides so it would withstand a lot of washing. I've fallen out of the habit of washing and drying a quilt right after I finish it. Probably because there is always plenty of laundry to do, so why add more to the pile? But, I washed and dried this one right away and the texture is pretty great! I may have wrapped up in it fresh out of the dryer, even though it's been warm here. 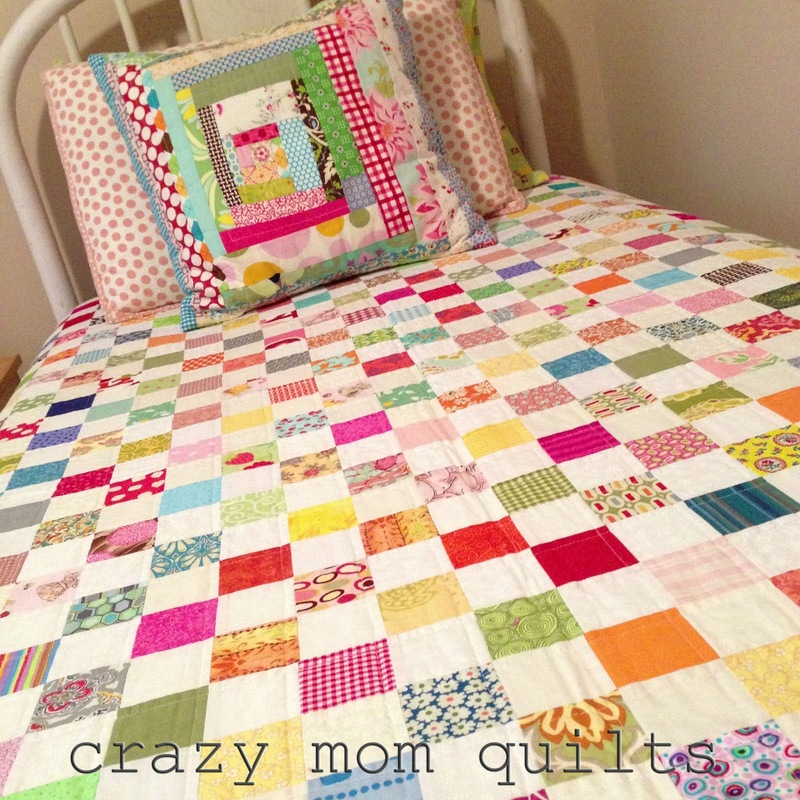 :) I'm so happy to have finished a quilt to share today. I need to do that more often! How about you? Do you have a finish to share? If so, please link up. Thank you for joining me for finish it up Friday!